PASCO’s ezSample™ water quality test kits simplify chemical testing of water sources–even for measurements requiring titrations. PASCO’s ezSample Field Titrators contain a vacuum-sealed quantity of titrant. The entire process requires only a minute or two, is completely portable, and avoids all the setup and cleanup associated with ordinary titrations.You won’t believe how easy it is to get great results–even in the field. 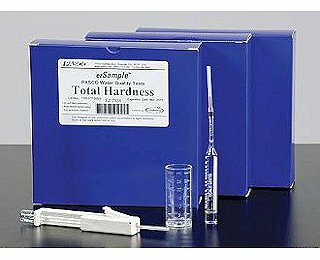 This kit contains 30 individual Total Hardness tests and one Field Titrator. Vials contain a vacuum sealed color forming reagent to test a variety of water quality parameters. 30 individual Iron test vials. Vials contain a vacuum sealed color forming reagent to test a variety of water quality parameters. 30 individual Ammonia test vials. Vials contain a vacuum sealed color forming reagent to test a variety of water quality parameters. 30 individual Phosphate test vials. Vials contain a vacuum sealed color forming reagent to test a variety of water quality parameters. 30 individual Chlorine test vials. Vials contain a vacuum sealed color forming reagent to test a variety of water quality parameters. 30 individual Alkalinity test vials. Vials contain a vacuum sealed color forming reagent to test a variety of water quality parameters. 30 individual Carbon Dioxide test vials.